Extinction? Every individual’s name was known. Upon hearing the quote above, the truth of it gutted me. If we lose the endangered Southern Residents, it will be the first time in human history that we let a population vanish having studied them for so long that each individual is known, most since their birth. Currently at 75 whales, we know what has depleted the Southern Resident population. We know the current threats they face (and we know that these are synergistic). We know that the threats will be intensified due to a changing climate. We know enough to provide a life history on every individual that dies – their age, their lineage, their culture. This captures so powerfully how we are participants in their demise. There is no surprise here. There is even acknowledgment by Canada’s National Energy Board of how precarious their survival is. In reviewing a proposed pipeline expansion they report: “Project-related marine shipping is likely to cause significant adverse environmental effects on the Southern resident killer whale”. And yet the recommendation is, to proceed with the Project. Please take the time to reflect on this, to help share the reality but not to give in to despondency. Rather rise to a roaring “HELL NO”. NOT on our watch. NOT with our knowing. I will say it again and again and again: the whales are barometers of our value systems and indicators of environmental health. How we treat them will ultimately be a measure of how we treat ourselves. We have to do better in understanding this and seeing the GAINS in weaning off fossil fuels, disposables, excessive consumerism and governments that wield fear and short-term economic arguments at the potential cost of . . . so much loss. Recognize the common solutions to socio-environmental problems, and apply your power as a consumer and as a voter. Care more. Consume less. Vote for future generations. Thank you Alexandra Morton for this wisdom, shared on March 4th by Dr. Paul Spong of OrcaLab. For better understanding of the plight of the Northern and Southern Residents, see the Recovery Strategy at this link. See Section 4 for Threats. There are many. The main threats are recognized to be prey availability (in particular, Chinook Salmon), chemical and biological pollutants and physical and acoustic disturbance. These are synergistic i.e. if the whales do not have enough Chinook, the fat-soluble toxins (both historic and emerging) enter their systems impacting immunity and ability to reproduce. If the whales are stressed by acoustic and / or physical disturbance, this can impede their ability to hunt, to fight disease and to carry out other essential life processes like nursing and resting. For more detail on the National Energy Board decision I reference above, see my previous blog at this link. 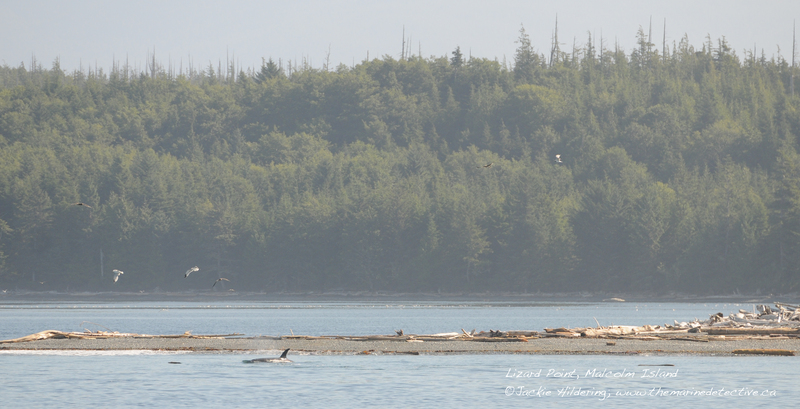 Photo: L-Pod in Blackfish Sound in 2009 ©Jackie Hildering. . They Can’t Thrive If We Don’t Change. When will we get it? When?! A science-based decision is made to extend critical habitat for the 74 endangered Southern Resident Killer Whales and what happens? Seventeen British Columbian coastal Chambers of Commerce “unite” in wanting to slow down potential further implementation measures claiming there has not been enough science done. The media release is here. I understand the climate of uncertainty I really do when you have a Federal Government that wants a pipeline to go through and is being “assessed” on how it will impact the marine environment. However, we cannot continue in the same way “defending” ourselves against potential fisheries closures and measures to reduce disturbance to the whales, claiming to love the whales and using them as a resource. This is so difficult to articulate but you cannot keep on keeping on and expect things to change for the better, especially in a world that is undergoing climate change. If we change we’ll lose jobs, jobs, jobs. Will we? What if we had a transition plan? What if we got ahead of the curve? What if we shed fear and entitlement and embraced precaution and human ingenuity, but not as an exit strategy? Pride and positive ownership can be taken in choosing for more modest takes of salmon i.e. 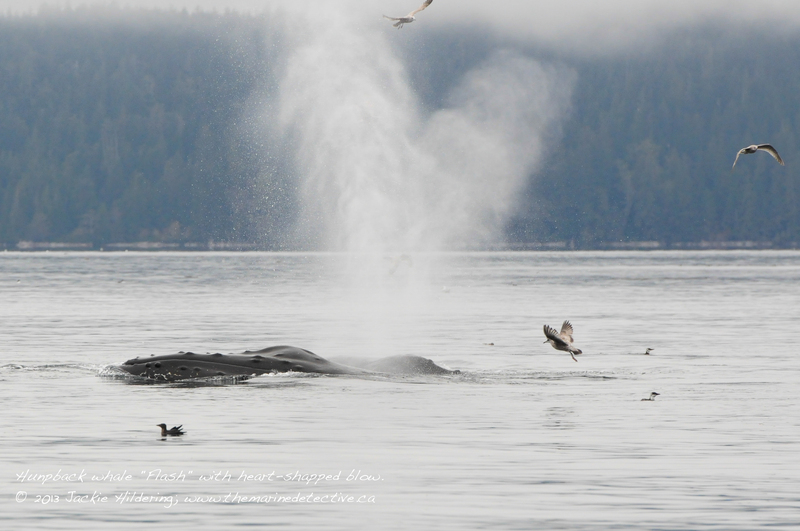 leaving Chinook for the Orca, and in wildlife viewing that reduces stresses to the whales. While we’re at it, let’s realize we are literally driving climate change and increased large vessel traffic on our coast through our excessive consumerism and demand for fossil fuels and our resistance to change, absence of understanding science, and being manipulated with fear. Further, the idea that salmon enhancement is a panacea defies science, especially in light of climate change and the fact that we are releasing juvenile salmon into a gauntlet of open net-pen salmon farms (which indisputably amplify and transmit disease and parasites). Note too that salmon enhancement facilities are very often beholden to the open net salmon farming industry as funders. Oh what a web we weave . . Precaution is not “let’s make sure we have done even more studies and then we’ll know for sure.” Precaution is the duty to prevent harm, even in the light of uncertainty and this involves urgency, not dragging our heals, gambling with the future. When will we learn to draw a bigger temporal circle around our consideration of economy? When will we truly recognize that the Orca are serving as indicators of environmental health and barometers of our value systems? The ultimate truth is that how we treat the whales will ultimately be how we treat ourselves, especially future generations. We are all consumers and voters here. We are all empowered to influence change. Photo: Member of the endangered Southern Residents in Blackfish Sound, ©Jackie Hildering. In an effort to protect their communities, the Chambers of Alberni Valley, Bamfield, Campbell River, Chemainus & District, Comox Valley, Duncan-Cowichan, Ladysmith, Greater Nanaimo, Parksville & District, Port Hardy, Port McNeill & District, Port Renfrew, Qualicum Beach, Sooke, Tofino-Long Beach, Ucluelet and WestShore have united to form a coalition called Thriving Orcas, Thriving Coastal Communities . . .
A43 “Ripple” of the A23s, August 22, 2015. @Jackie Hildering. The A23 matriline of Northern Resident Killer Whales / Orca has been seen by thousands and thousands of people. They are one of the families that most often chase salmon in the Johnstone Strait area (NE Vancouver Island) and therefore, have been observed and photographed by so many whale watchers and have been studied by researchers since the early 1970s. They are also featured in the documentary “Realm of the Killer Whales” for which the PBS film crew, under special permit in 1997, was able to get remarkable footage of the A23s beach-rubbing in the Robson Bight (Michael Bigg) Ecological Reserve (see this link for underwater footage of beach-rubbing – as of timestamp 48:15). – Members of the N. Resident population; ~295 whales (end 2015); threatened population. – “Residents” do not stay in one area; they are inshore fish-eating Killer Whales. Prefer salmon, especially Chinook. They often share their catches. – They stay with mother, siblings and offspring their whole lives. – Mating can happen when different N. Resident matrilines come together but, ultimately, males leave with their family and females leave with theirs. – Each matriline sounds different; aiding in determining degree of relatedness and avoiding inbreeding. – Only the N. Residents have the culture of rubbing on smooth, stone beaches. Click here for more. – In BC there are also S. Resident Killer Whales (endangered); and mammal-eating and offshore fish-eating populations (both threatened). – See this link for more on the kinds of Killer Whale populations in BC. So many human eyes have been cast upon them, but so few of us are aware of what this family has endured. 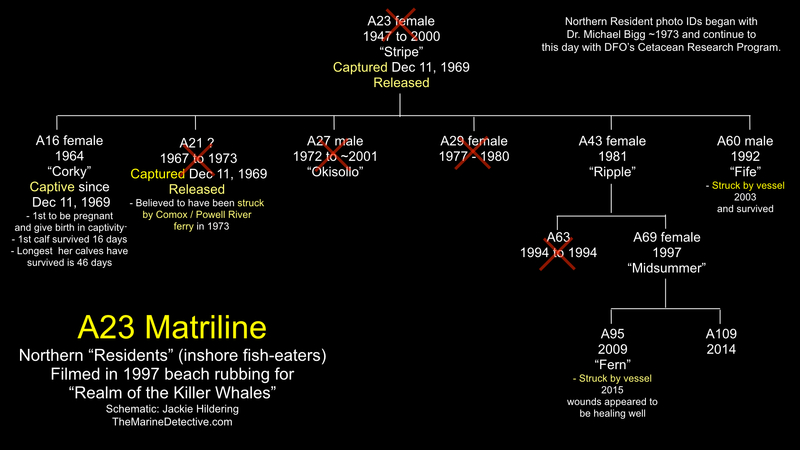 This is the story of the A23s, and what one Killer Whale family’s history reveals about us. Knowledge about the A23 matriline goes back to at least 1969 when we did not even know that there are different populations of Killer Whales with distinct culture. We also sure didn’t have knowledge of their intelligence, long-lived family bonds, and limited numbers (all Killer Whale populations in BC are at risk). “The killer whale is well designed for a career of destruction and mayhem”. Killer Whales are “extremely ferocious” and will “attack human beings at every opportunity”. Extremely ferocious? Terrifying? Monster? Designed for a career of destruction and mayhem? Please see below for my summary of what the A23s are known to have endured since 1969 (based largely on the longterm population study by DFO’s Cetacean Research Program). Summary of the known history of the A23 matriline. Click to enlarge. Note that at least three family members were hunted down and captured; one is still in captivity (poor Corky’s been there for 46 years! ); and two or three have been hit by boats. 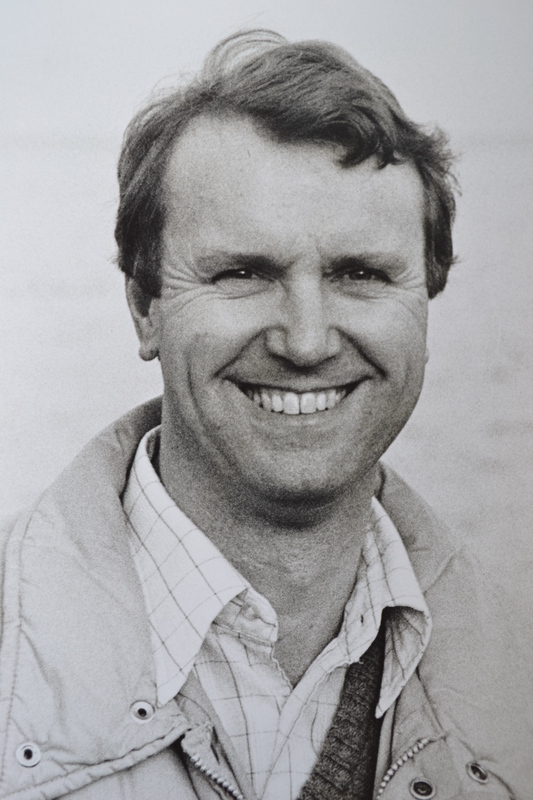 Further, it is very likely that family members were shot at and possibly killed but that this has not been documented because the late Dr. Michael Bigg only began his revolutionary work to study Killer Whales as individuals in 1973. It is not known how A27, A29 or A63 died. Oh Corky! The longest surviving Killer Whale in captivity. – On December 11th, 1969 A23 “Stripe” and her calves, A21 and A16 “Corky”, were among 12 whales captured at Pender Harbour, BC. Six were released including A23 and A21 and six were retained to be sold to aquariums – this included “Corky”, desirable as a young female who might give birth in captivity. – In 1977, she indeed was the first to conceive and give birth in captivity. She has been pregnant 7 times but none of her calves survived beyond 46 days. – Corky is still in captivity today in San Diego, 46 years later. – Read more about Corky from OrcaLab at this link (click “Corky Campaign” and then “Corky’s Story”). In having the great privilege of often seeing Killer Whales in the wild, it is so powerful to recognize a family like the A23s and be aware of what they have endured. Granted, some tragedy was accidental, but so much was the result of our ignorance and vilification. 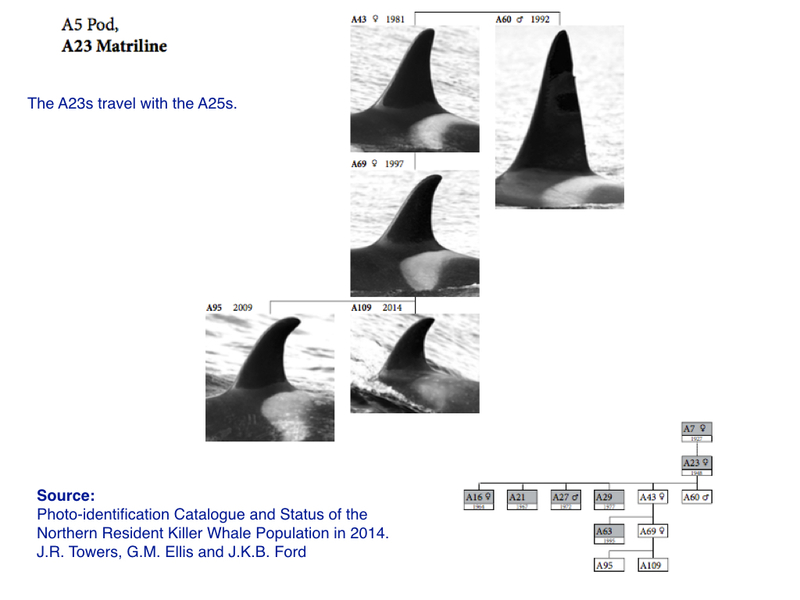 The A23 matriline from “Photo-identification Catalogue and Status of the Northern Resident Killer Whale Population in 2014”. J.R. Towers, G.M. Ellis and J.K.B. Ford. Click to enlarge. But the story of the A23s also provides insight into how we have changed, now that knowledge has replaced fear and the fallacy of the “educational value” of Killer Whales being in captivity has been exposed as desire for commercial gain. We’ve come a long way. As an indicator of this, on December 11th, 1969, members of the A23 matriline were being pursued and captured for captivity. Yesterday, 46 years later (January 14th, 2016), in the wilds of Johnstone Strait, the A23s (and A25s) were being studied by Jared Towers of the DFO Cetacean Research Program. Continuing the work pioneered by Dr. Bigg, he photo-documented them, took note of how the vessel-strike scars were healing (see photos below), and collected prey samples so that winter diet may be better understood. A23s on November 9th, 2015. Photo: Jackie Hildering. The Killer Whales of British Columbia have been studied as individuals in this way longer than any other marine mammal. The knowledge gained has led to where we are now. For the most part, there is no social license/tolerance for Killer Whales being in captivity. There is federal legislation aimed at the protection of BC’s Killer Whale populations and their habitat. They are not to be disturbed as per the Be Whale Wise guidelines and there is global interest in them with evidence of this including the contribution whale watching makes to BC’s economy. Now, the dominant perceptions are that Killer Whales are iconic; powerful symbols of all that is wild and free; and that it is remarkable, considering our complicated history with them, that there has never been a documented attack by a Killer Whale on a human in the wild. Many of us would agree that the descriptors “ferocious”, “terrifying”, “monster” and “designed for a career of destruction and mayhem” are better applied to humans than Killer Whales when we act with ignorance, greed, and disconnect from nature. What story will the next 46 years tell – about us, about them? I am so hopeful that we will better understand how our use of contaminants and fossil fuels impacts them, and the rest the marine ecosystem upon which human health also depends. Thereby, there will be more positive stories for our future generations – and future generations of the A23 matriline. A23 and A25 matrilines were in Johnstone Strait, January 13 and 14, 2016. Photo from August 26, 2015. From front to back: A60, A69, A109, A43, A61. Photo: Jared Towers, DFO Cetacean Research Program; taken with telephoto lens under research permit. Likely you’ve seen it – Chris Wilton’s video of Killer Whales* / Orca rubbing on a beach in the Discovery Islands on January 29th, 2015, the whales only within ~1.5 metres of the incredibly fortunate humans’ feet? I became a resource to the news for interpreting the whales’ behaviour in this video as a result of my posting their IDs and commenting on the behaviour on social media. However, it proved difficult to extinguish some misinterpretation and misinformation, for example, the notion that the behaviour captured in the video was rare e.g. “B.C. orcas’ rare beach-rubbing behaviour caught on video” (CBC News. January 31, 2015). It’s not rare behaviour at all. It is rare that people get to see it. That’s what has motivated me to write this blog but before I proceed let me qualify that while I have spent a lot of time staring at Killer Whales through binoculars, I am a Humpback Whale researcher and marine educator. Everything that is known about Killer Whales is due to the long-term population study by DFO’s Cetacean Research Program. It began in 1973 with the late, great Dr. Michael Bigg and as a result, the Killer Whales of British Columbia have been studied as individuals longer than any other marine mammals in the world. Thanks to the Cetacean Research Program’s work, identifying the whales in Chris’ video was easy. I recognized that they were beach-rubbing and, therefore, they had to be members of the threatened Northern Resident population. “Resident” Killer Whales are inshore, fish-eaters who can best be described as “Chinook-aholics”. The Northern Residents are the only Killer Whales of BC’s four distinct populations that rub on smooth pebble beaches. When the video was brought to my attention, I was with two fellow Humpback Whale researcher friends, and we laughed aloud at about 1:56 in the video because there was mature male A66 (“Surf”), almost stationary on the beach. His left side was facing Chris’ camera, making it so easy to see his distinct saddle patch and the nick in his dorsal fin. It simply could not have been easier to identify him. Screen grab from Chris Wilton’s video showing why it was so easy to identify A66 / Surf. Used with permission. Ah ha! If Surf was there, his mother and three siblings had to be there too for such is the way of “Resident” Killer Whales; they stay with their mothers for their entire lives, seldom separated by more than a short distance. If the mother dies, the remaining family members stay together. Northern Resident families are in fact named for the eldest female who is believed to be the leader, A42 in this case, and the families are known as “matrilines”. This term loosely translates into “follow your mother”. Upon viewing the rest of the video, we could confirm that all five member of the A42 matriline were indeed there. Surf was with his mother, Sonora, and her three other offspring. [Update 2017: Sonora has had another calf, making for a matrilne of 6 whales]. Markings in blue are mine. Source: Northern Resident Killer Whales of British Columbia: Photo-identification Catalogue and Population Status to 2010; G.M. Ellis, J.R. Towers, and J.K.B. Ford. Nicknames determined via the Wild Killer Whale Adoption Programme. So what’s with the beach-rubbing? Absolutely essential to understanding this behaviour is to know that the Killer Whales of the world have culture. Like humans, they have specialized to make use of certain prey and the geography of their area e.g. specializing in eating salmon vs. marine mammals. In BC, the four Killer Whale populations (Northern Resident; Southern Resident; Offshore; and Bigg’s / Transients), overlap in their ranges but the populations have different languages and do NOT mate with one another. Thereby, they preserve the culture and traditions of their populations. To emphasize just how long-lived these cultural differences and specializations are, know that the mammal-hunting Bigg’s / Transients diverged from the other kinds of Killer Whales 700,000 years ago! As mentioned, throughout the Northern Resident Killer Whales there is the culture of skidding their bodies over sloping beaches of smooth pebbles. None of the Killer Whale populations with which they have overlapping range in British Columbia have this behaviour. (Note: The AK Pod of Alaskan Residents is also known to beach rub. Please see detail at the end of the blog). As you can see in Chris’ video, in order to get down low and in contact with the rocks, they often super-deflate their lungs to reduce buoyancy, releasing a gush of bubbles. They rub all parts of their bodies. Sometimes they do this for a few minutes, and sometimes for more than an hour. In OrcaLab’s video below, you can see underwater footage of the behaviour. Video was taken with remote underwater cameras under permit from Fisheries and Ocean’s Canada. The behaviour can’t be about rubbing off parasites! The skin of Killer Whales sloughs off like ours does and therefore there’s no “fouling” of barnacles like there is on Humpbacks and Grey Whales. And hey, if it was due to ectoparasites, the other Killer Whales in BC would have them and be beach-rubbing too! Beach-rubbing by the Northern Residents must be a social and recreational behaviour. A whale massage? Certainly it must feel good. Maybe, as an additional benefit, doing something you enjoy together also further solidifies family bonds (social cohesion being needed for community maintenance)? Reportedly, the vocals sometimes made by the Northern Residents while beach-rubbing support that this is a social behaviour since they are the same “looney tunes” made when Northern Resident families reunite. Again, it is not rare for the Northern Residents to beach-rub at all. It is a regular social behaviour. What’s quite rare is that there were humans present on a beach when the behaviour was happening since where the whales most often are known to rub is a no-go zone. These best known rubbing beaches are on NE Vancouver Island, in the Michael Bigg Ecological Reserve at Robson Bight in Johnstone Strait. The Northern Resident matrilines that most often feed in this area use these beaches to rub with incredible regularity, including the A42s – the whales that Chris videoed beach-rubbing much further to the south, around central Vancouver Island. These Robson Bight beaches are within recognized critical habitat for this population and are fully protected. The waters around these beaches are a restricted area as well. But Northern Resident rubbing beaches are found all along our Coast and I believe that individual families have preferences, places they have been rubbing generation after generation after generation. There are Northern Resident families that rarely come into Johnstone Strait and they must have their equivalent of a Robson Bight somewhere else on our coast. As confirmed by Dr. John Ford, head of DFO’s Cetacean Research Program, the Strait of Georgia where Chris got the video has been known to be part of the range of the closely related families to which the A42s belong (the A5s) since the 1960s and likely for many, many years further back. However, at that time, we would not have been collecting the data. In 1961, near to where the video was taken, a 50-calibre machine gun was positioned for the purposes of executing Killer Whales and, as of 1964, it became common to attempt to capture them for captivity. Just 55 years later, in January 2015, Chris and others stood on a beach in the Discovery Islands marvelling at what they were witnessing, recognizing their good luck to see this wild behaviour, and being able to record it in the video that has now gone viral. Thank goodness that we have this capacity for positive change and that it’s now NOT rare that people feel a strong concern for and connection to Killer Whales. I believe that the wide reach of Chris’ video has led to raised awareness about how cultured and social Killer Whales are and how lucky we are to have them as our marine neighbours. Maybe that awareness will be reflected in further changes that benefit the whales and the marine ecosystem for which they are ambassadors? Then we’d be rubbing the right way and have more reasons to bubble with happiness. Northern Residents using a rubbing beach on Malcolm Island off NE Vancouver Island. For more information on these beaches see Friends of the Wild Side. Video 2015 by – beach rubbing by A42s near Powell River. Video January 27, 2018 by Sasha Koftinoff – beach rubbing by A42s near Sechelt. Video January 27, 2018 by Martin Michael – beach rubbing by A42s + other Northern Residents near Sechelt. Video January 27, 2018 by Bruce Robinson – beach rubbing by A42s + other Northern Residents near Sechelt. Video – Feodor Pitcairn’s 2001 “Realm of the Killer Whales” with underwater footage of the beach-rubbing as of timestamp 48:15. This footage was obtained as a result of a special DFO permit. *Scientific convention is to reference Orcinus orca as Killer Whales. Many prefer “Orca” but please know that Orcinus orca loosely translates into “demon of the underworld”. The whales did not name themselves, we did and locked within the names is our misunderstanding and complex history with these remarkable, social, intelligent, big dolphin. 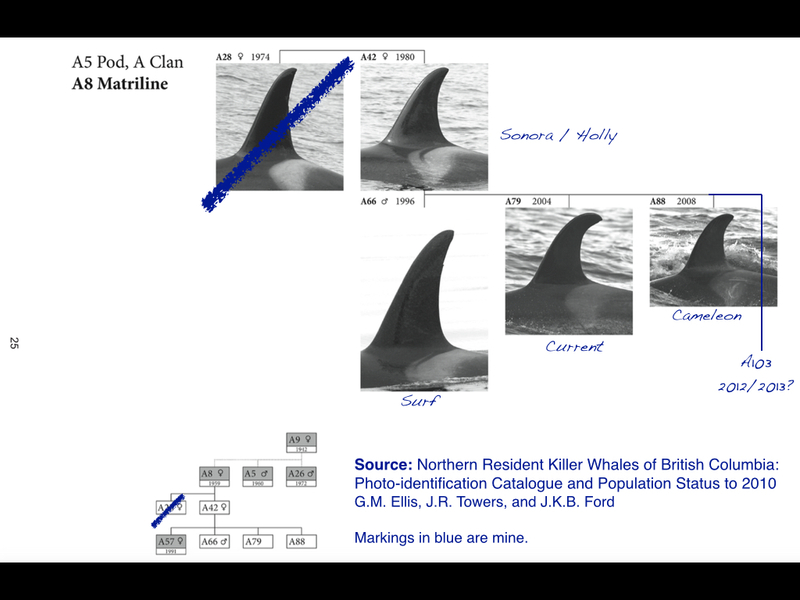 For more information on the BC’s Killer Whale populations see this previous blog or Dr. John Ford’s book Marine Mammals of British Columbia, 2015. 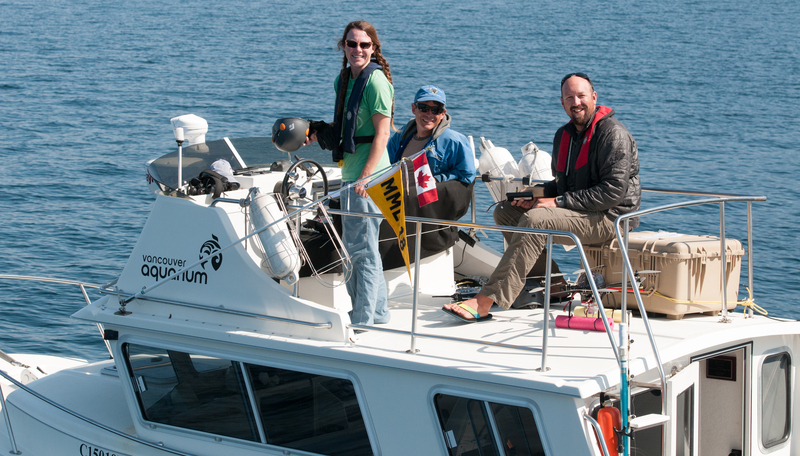 For more footage from the OrcaLab cameras and hydrophones from NE Vancouver Island click here. You can sign-up for text alerts by scrolling down at that link and filling in the field on the bottom left. For potential impact of boat presence on rubbing behaviour, see Estimating relative energetic costs of human disturbance to killer whales (Orcinus orca). Rob Williams, David Lusseauc, Philip S. Hammonda (2006). This blog led to my being interviewed for BBC’s “Ingenious Animals”. The episode includes a compilation of video of Northern Resident matrilines beach-rubbing. Available at this link as of 41 min. Members of AK pod are known to beach rub using “several different rubbing locations in Prince William Sound as well as in Kenai Fjords and Resurrection Bay.” Source: North Gulf Oceanic Society. Alaskan Residents’ range overlaps with that of the Northern Residents, especially in Frederick Sound. It is unknown how often the Northern Residents and the AK pod of Alaskan Residents do or do not overlap in their ranges. Video below shows beach-rubbing in what is very likely Alaskan Residents (members of AK pod) by Eric Eberspeaker – August 2015; Kenai Fjords Wilderness Lodge on the shore of Fox Island. You’ll note there are some very unique human vocals resulting from witnessing the beach rubbing. Whale researchers generally have some pretty lofty goals but the methodology being used to study the health of at-risk Killer Whales might have the highest standard of all – literally. 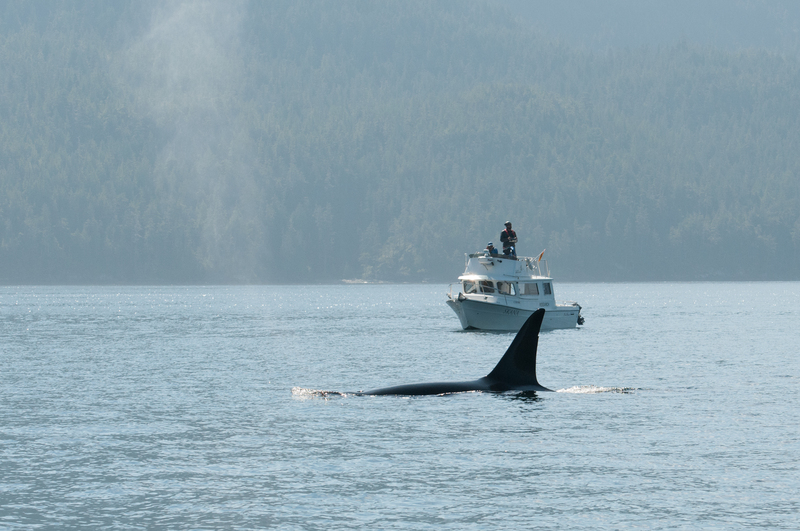 With Johnstone Strait being one of the most predictable and sheltered places to see Killer Whales, many of us seafarers on Northern Vancouver Island had a front row seat in seeing what was “up” with this research. A marine “hexacopter” was used, a drone with a camera mounted to it that soars 30m or more above the whales to obtain high quality video and photos that provide very valuable information about the whales’ fitness. Ready for take-off: Olympus E-PL2 camera mounted to the APH-22 marine hexacopter. Photo Hildering. Dr. Holly Fearnbach releasing the helicopter. Dr. John Durban centre and Dr.Lance Barrett Leonard on the right. Photo: Hildering. 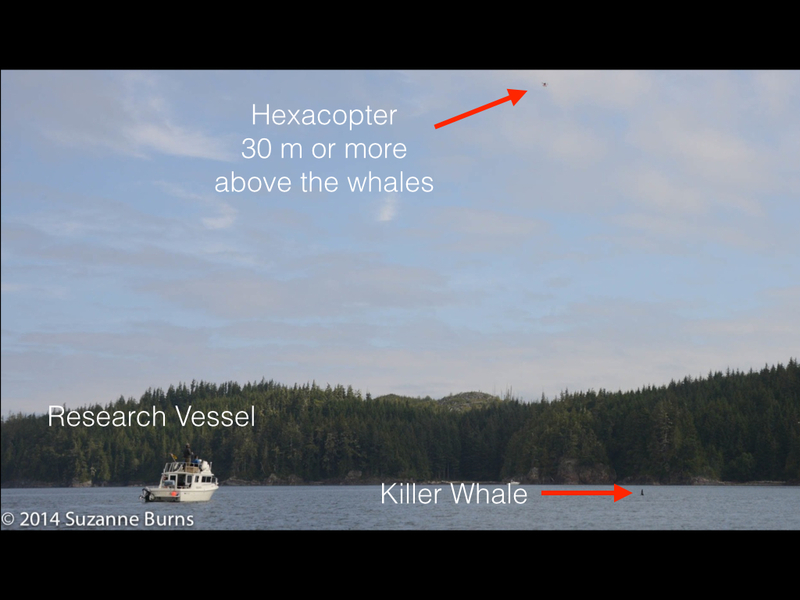 Photo by Suzanne Burns showing how benign this method of study is – the research boat is +/- 100m away and the hexacopter with camera is 30m or move above the whales. All Killer Whales in BC are all at risk (Threatened or Endangered) and by getting the images from on-high, it is possible to better determine if the whales are thin and even if they are pregnant. This provides vital data such as being able to know if pregnancies did not go to term and how much the fitness of “Resident” Killer Whales depreciates in years of low Chinook salmon abundance. “Resident” Killer Whales are inshore fish-eating populations culturally programmed to be “Chinook-aholics” and their survival has been proven to be directly correlated to the abundance of Chinook salmon. Here are some examples of the data obtained via hexacopter, revealing good news and bad news. The bad news first . . . When Killer Whales are in dire condition and lose too much fat, this manifests as “peanut head”, sunken areas near the eye patches. I see this as the equivalent as sunken cheeks in the gaunt faces of underweight humans. A Killer Whale with “peanut head” where the extreme loss of fat around the head causes sunken areas in the whale’s head. 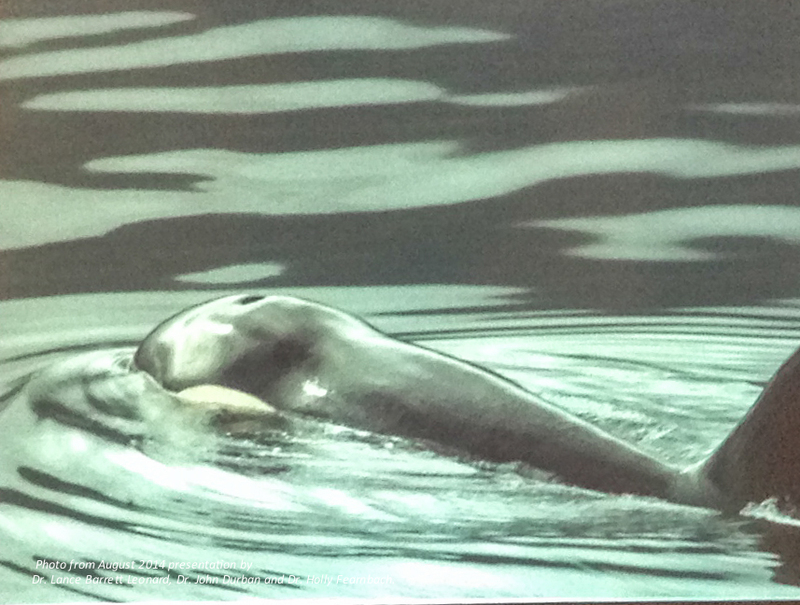 This is a photo of a slide from the presentation given by Dr. Lance Barrett Leonard, Dr. John Durban and Dr. Holly Fearnbach at Telegraph Cove’s Whale Interpretive Centre on August 25th, 2014. The images obtained with the hexacopter revealed that “Northern Resident” Killer Whales A37 and I63 were in extremely poor condition and, in fact, the whales disappeared from their matrilines (families) shortly after the images were taken. “Resident” Killer Whales stay with their families their entire lives so absence from the matriline most often means death. The cause of death cannot be determined but know that when fat stores are get used up, manmade fat-soluble persistent organic pollutants (such as brominated fire retardants, PCBs, dioxins, etc) are released and affect the whale’s immune system. The mammal-eating Killer Whale of BC are known to be the most contaminated animals on earth. In the presentation the research team provided in Telegraph Cove, I was gutted by the images of “Plumper” (A37 of the A36s) and I63 which showed concave eye patches and a tadpole-like body shape. The image of Plumper was contrasted to a healthy mature male Killer Whale (see below). As explained by Dr. Durban, Killer Whales when faced with fat loss, put water into the blubber layer so that they remain stream-lined. Plumper had lost so much fat, that it appeared he had to keep his pectoral fins extended to remain buoyant. Ugh. Image taken from the hexacopter revealing A37’s very poor condition. He disappeared about 10 days after this photo was taken. 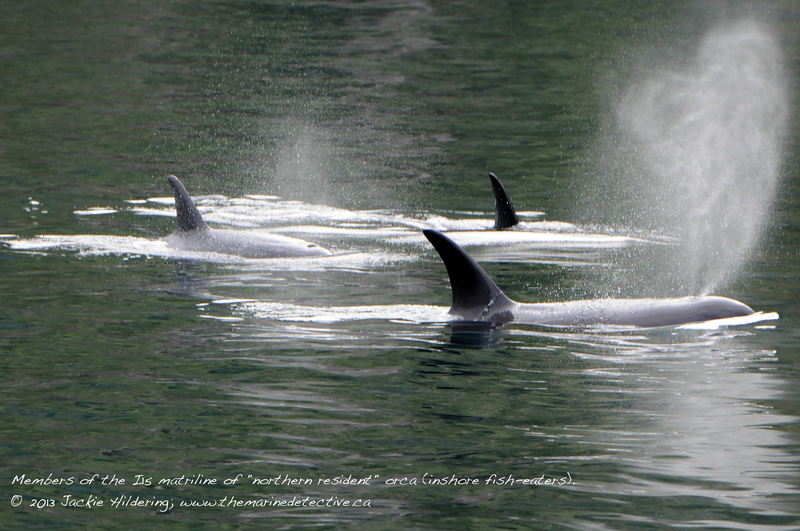 A37 aka “Plumper” was one of the last 2 remaining whales in the A36 matriline of “Northern Resident” killer whales. He was 37 years old. The hexacopter study reveals that his brother A46 aka “Kaikash” is in good condition and he has been seen travelling with members of closely related matrilines. The above is a photo of a slide from the presentation by Dr. Lance Barrett Leonard, Dr. John Durban and Dr. Holly Fearnbach at Telegraph Cove’s Whale Interpretive Centre on August 25th, 2014. Image revealing I63’s very poor condition. She disappeared from her matriline about a week after this photo was taken (I15 matriline of “Northern Resident” killer whales). She was 24 years old. The above is a photo of a slide from the presentation by Dr. Lance Barrett Leonard, Dr. John Durban and Dr. Holly Fearnbach at Telegraph Cove’s Whale Interpretive Centre on August 25th, 2014. Data collected also revealed fat calves, robust nursing mothers, and pregnant females. Below, Dr. John Durban shares an image of 34-year-old “I4” of the I15 matriline of “Northern Residents” revealing that she is pregnant again. Happy news! Photo taken from the hexacopter revealing that I4 is pregnant again (she is the whale at the bottom of the image). With gestation being 17.5 months in killer whales and that, around the world killer whales give birth in the winter, I4 is likely about 1 year pregnant in this photo. Photo taken during presentation by Dr. Lance Barrett Leonard, Dr. John Durban and Dr. Holly Fearnbach at Telegraph Cove’s Whale Interpretive Centre on August 25th, 2014. Photo: Hildering. I am in no way advocating for the unregulated use of drones for viewing whales. The researchers reported that the regulatory paperwork needed to get approval for this research weighed more than the hexacopter did and that they were glad that this was the case. This research methodology, when applied correctly, is a wonderful example of how advances in technology can lead to advances in knowledge in a way that is benign to wildlife. The sky’s the limit in how we let this knowledge impact our day-to-day actions to improve the health of the marine environment for which Killer Whales serve as powerful sentinels. How high will you go for the sake of Killer Whales and what they are revealing about the health of our life-sustaining oceans? 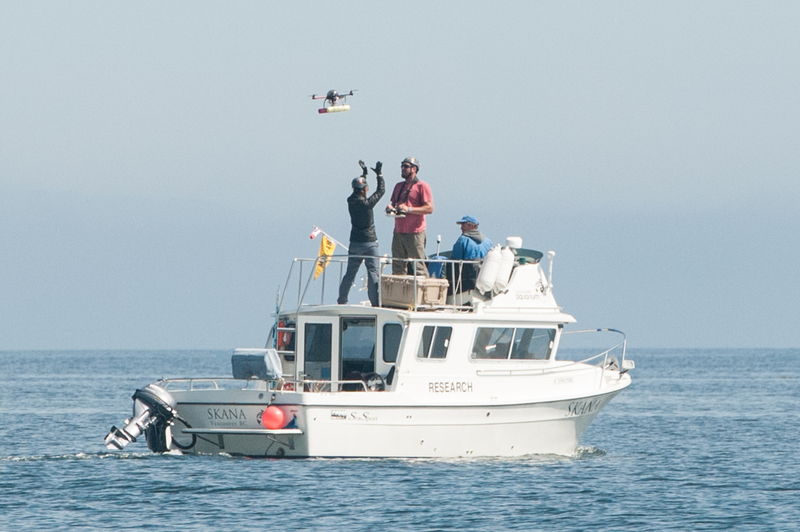 The hexacopter research allowed for an assessment of the fitness of 77 “Northern Resident” Killer Whales (inshore fish-eaters) and 7 “Bigg’s” Killer Whales (mammal-eaters aka “Transients”) by the research team during 2 weeks in August. Here, mature male mammal-eating killer whale T060C is being photographed from on high. Photo: Hildering. 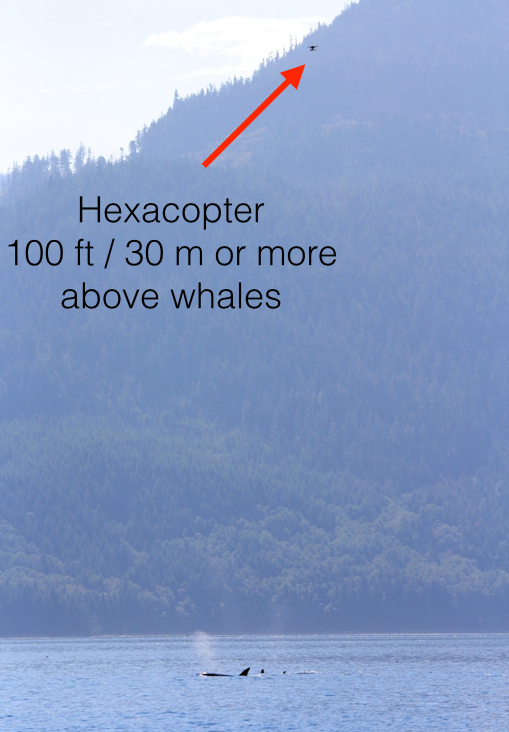 Photo by Laurie Sagle showing how high the hexacopter is above the whales. The research team: Dr. Holly Fearnbach; Dr. Lance Barrett-Leonard; and Dr. John Durban. Photo: Hildering. Apologies for a longer absence here. It has been a full summer of marine research, education and inspiration. I will have the joy of sharing much with you in the coming months. 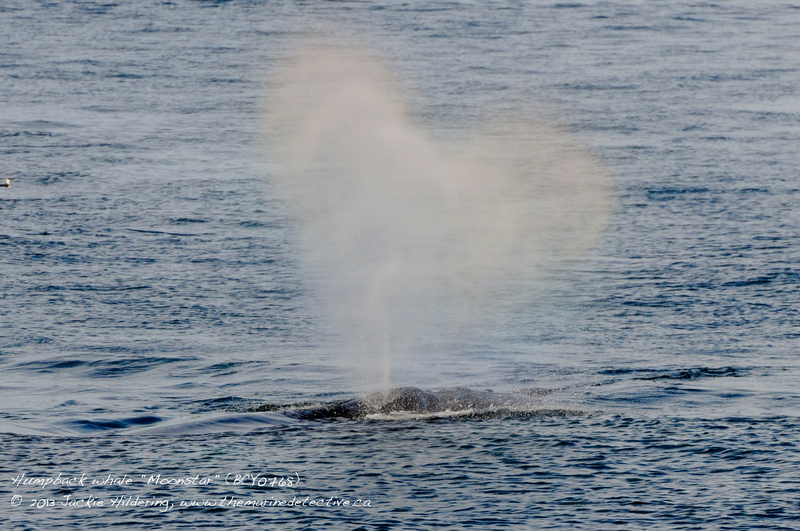 For now – three remarkable images taken in the last months where the whales’ blows are heart-shaped. With whales being ambassadors for marine ecosystems in so many ways, these images may be particularly engaging – suggesting that we should love the Oceans as if our lives depend on them because . . . they do! Also to make your heart sing, see the clip below (or access it at this link). I was able to capture the vocals of northern residents AND humpbacks from one of the most mind-blowing days I have ever had the privilege of experiencing on the water. Enjoy! [These images and video were previously shared on the TMD FaceBook page]. Super hero – Dr. Michael Bigg. Achieved so much before passing at just age 51 (1939 to 1990). Photo ©Graeme Ellis. This is because a 2010 study found that the mammal-hunting ecotype of Killer Whales / Orca diverged from the other ecotypes some 700,000 years ago and the researchers (Morin et al) put forward that they be recognized as a distinct species. If they are to be recognized as such, many in whale-research-world believe it is only appropriate that the species be named in honour of the late and great Dr. Michael Bigg whose pioneering Killer Whale ID research in the eastern North Pacific in the 1970s – 1980s revealed that Killer Whales have distinct populations and that there are very limited numbers within these populations. Ultimately, his research led to the understanding that Killer Whale populations have distinct cultures. 1. Bigg’s Killer Whales are marine mammal-hunters (they also eat an occasional bird and, very rarely, a terrestrial mammal). Because they are hunting marine mammals, they generally have to be stealthy and unpredictable (when hungry). The population estimate for this threatened population is 300 individuals (2017) that are more often along coastal BC, with research ongoing regarding population numbers further off the coast (see “Biggs/Transients” information at this link). Their behaviour has changed in recent years, as reported by colleague researchers at the Marine Education and Research Society. They are not so “transient” anymore. In some areas they are more commonly sighted than “Residents” and appear to be travelling, socializing and hunting in bigger groups. They also appear to be more vocal, especially after a kill. This may be due to changes in the location and density of their prey. Status report and further information at this link. Note that there are no documented incidents of Bigg’s Killer Whales in the wild ever injuring a human. “Residents” are inshore fish-eating Killer Whales (ingesting an occasional squid too) and there are two distinct populations. The vast majority of their fish diet is salmon and of the salmon species, their absolute favourite is Chinook. (Their diet is also known to include lingcod, halibut, herring, squid, rockfish, flounder). Because salmon is so predictable (salmon return to the river of their birth to spawn and die) and because fish have very bad hearing, these populations of Killer Whales can afford to be highly vocal and use echolocation a lot. 2. The Northern “Residents” are a threatened population of some ~305 whales (2017) more often found in northern British Columbia but also in southeastern Alaska and Washington State. Status report and further information here. For the story of one N. Resident Killer Whale family (the A23s) and what their story reveals about us, click here. 3. The Southern “Residents” are most often swimming around southern British Columbia and Washington State but are sometimes also in the waters of northern British Columbia, Oregon and California. At only 75 individuals (2018), this population is recognized as being endangered. Status report and further information here. 4. Offshore Killer Whales are fish-eaters often found along the continental shelf from the Aleutian Islands to California. To date, published research has confirmed that their diet includes Pacific Sleeper Sharks and Pacific Halibut. The population estimate is 355 individuals (2017) and this too is a threatened population. Status report and further information here. Through the research of Dr. Bigg, the Killer Whales of British Columbia have been studied as individuals longer than any other marine mammal species on the planet – and not only marine species have benefited from this. We all have. Due to his work, whereby the age, gender, diet and range is known for almost every Killer Whale in British Columbia, these whales “tell the story” of global chemical pollution. The work of Dr. Peter Ross examines the toxins in the blubber and indeed the Killer Whales of BC are the “canaries in the coal mine” informing the science that should shape international policies and regulations regarding toxins. 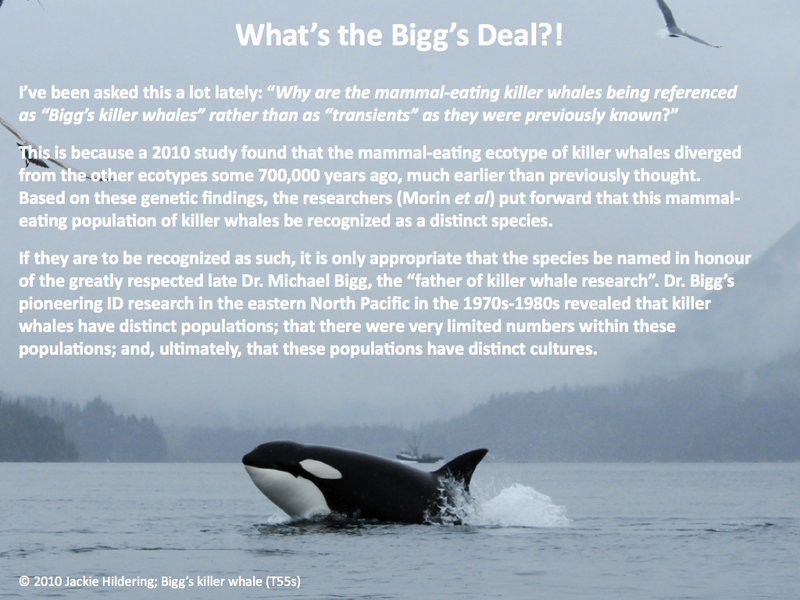 However, there is also much that has NOT changed since the days of Dr. Bigg’s pioneering Killer Whale research. At that time, Killer Whales were the scapegoat for declining salmon populations and the “gold rush” on their being put into captivity was likely perceived as a favourable management tool. Conservation costs money, not only for science and management, but also by limiting industries whose activities may negatively impact species at risk. Flash forward some 40 years to 2013. Dr. Peter Ross’ work with Fisheries and Oceans Canada has been terminated as part of what can only be called the demise of Canada’s ocean contaminants research program and prior to his termination he, like so many other government scientists in Canada, has been constrained in being able to communicate about his research. (Update 2014: Dr. Ross now heads the Ocean Pollution Research Program at the Vancouver Aquarium). The ultimate Bigg’s Deal is that one person can make a profound positive difference – replacing knowledge where fear and misunderstanding once dwelled. However, to work against government forces that imperil our environment and suppress science in favour of short-term economic gain, it is going to take a very great many of us to make our voices and actions . . . Bigg-er. British Columbia Magazine; November 2016; BC’s Pioneer of Killer Whale Research. Bundling of news items related to the muzzling of Canadian scientists. Oh Deer! A rare meal for mammal-hunting killer whales? This is not a tall tale. If anything it is a short tail as in – deer tail. First an orientation on Killer Whale (Orcinus orca) diet and how prey specialization has shaped distinct cultures over great expanses of time. The fish-eating Killer Whale ecotypes in the NE Pacific Ocean (Northern and Southern “Residents” and “Offshores”) can afford to be extremely vocal because fish species often have poor hearing. In fact, recent research supports that the NE Pacific mammal-hunters diverged from the other ecotypes of Killer Whales some 700,000 years ago and puts forward that they should be recognized as a distinct species (Morin et al 2010). Research of Dr. John Ford & Graeme Ellis on the diet of mammal-hunting Killer Whales in the Northeast Pacific Ocean. Source: Presentation “The Complicated Predator” ; Dr. Lance Barrett-Lennard; October 2005. Pacific Harbour Seals are predictable in where they haul out and they do not have defences like speed and sharp teeth. Therefore, it is not surprising that off the coast of British Columbia, Pacific Harbour Seals are documented to be the prey item of choice for the mammal-hunting Killer Whales (see graph above). Far less commonly, these Killer Whales have also been documented to feed on River Otters, Northern Elephant Seals, Sea Otters and – VERY, VERY occasionally – a terrestrial mammal like deer. 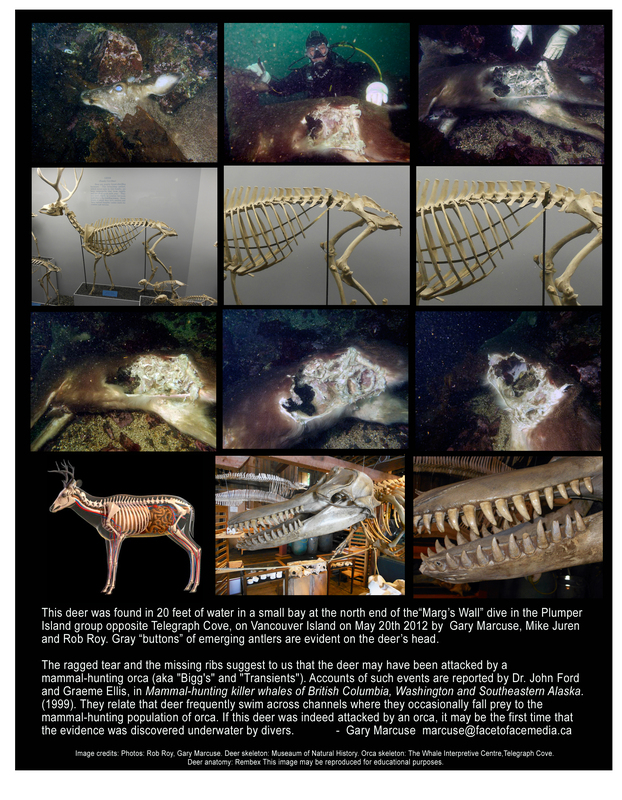 Please see below for images of a deer carcass found underwater by fellow divers Gary Marcuse, Rob Roy and Mike Juren in May of 2012. There is no way of knowing with certainty if that this deer was attacked by Killer Whales but it is plausible. Deer swim from island to island and are even more defenceless than a seal if they have the bad luck that stealthy mammal-eating Killer Whales find them. Killer Whales are big dolphins – smart and social and even though they tend to be very conservative, doing what has worked for their kind for 100,000s of years, they also play – learning from interacting with their environment. I have reflected on this previously in my blog where I observed them mouthing and hitting diving birds. (Read “Fins vs. Feathers” by clicking here). Deer could never make up a significant part of the diet of Bigg’s Killer Whales but they would learn from such an attack. If this deer did indeed meet its end in the mouth of a mammal-hunting Killer Whale, I would not be surprised if it was a juvenile mammal-hunting Killer Whale who undertook the “interaction”. “Although the primary prey of transient [now Bigg’s] killer whales are marine mammals, the whales’ interest extends to other warm-blooded animals, including marine birds . . . and even terrestrial mammals. Our first record of land mammal predation dates from June 1961, when Canadian fishery officers observed killer whales feeding on a deer carcass in Jackson Pass on the central coast of British Columbia. Deer frequently swim from island to island along the inside passages, and it is probable that this one fell victim to a foraging group of transients. More recently, off the east coast of Vancouver Island, several killer whales were observed circling a small rock on which two deer had taken refuge. On another occasion, a lighthouse keeper assisted an exhausted deer out of the water as it was being pursued by killer whales. In these case, there has been no photographic confirmation that transients were involved, but it seems almost certainly the case. Other land mammals are also of interest . . on occasion . . . a killer whale was observed to surge part way onto shore in an apparent attempt to attack a dog that was barking loudly at the passing group. . . . So am I worried, as a very avid and very mammalian scuba diver, that I have the same chances of being attacked as a deer swimming between islands? Absolutely not. There has never been a case of Killer Whales in the wild killing a human. Ford, J.K.B. et al. 1998. Dietary specialization in two sympatric populations of killer whales (Orcinus orca) in coastal British Columbia and adjacent waters. Canadian Journal of Zoology 76(8): 1456-1471. Ford, J.K.B., Ellis, G.M., Matkin, D.R., Balcomb, K.C., Briggs, D., and Morton, A.B. 2005.Killer whale attacks on minke whales: prey capture and antipredator tactics. Marine Mammal Science 21:603-618. Kuker, K., and Barrett-Lennard L. 2010. A re-evaluation of the role of killer whales Orcinus orca in a population decline of sea otters Enhydra lutris in the Aleutian Islands and a review of alternative hypotheses. Mammal Rev.